The Bunny Ring: A pattern and tutorial! Nothing says Easter Sunday like some Silly Pink Bunnies, so in celebration of the season I’ve created my first Croshame pattern, a Bunny Ring! It’s my first venture into both the pattern-writing and video tutorial arenas, so they might be a little rough around the frayed, stained edges — but in the end, it’s all bunny love, baby. That, and some 20+ hours of editing. Enjoy! This entry was posted on April 24, 2011 by croshame. It was filed under Amigurumi, Croshame, Patterns, Tutorials (aka 'tude-torials) . Hey – I like your tutorial, it’s fun, funny, easy to follow. The tiny hand made me chuckle. Keep up the good work! EEII!very funny and original! i like a lot. 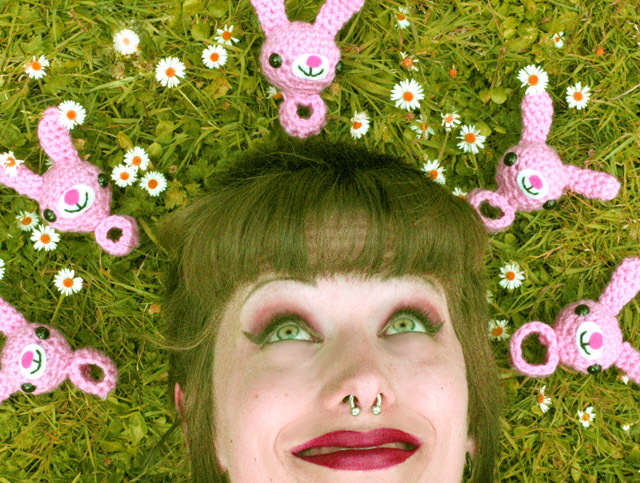 i’m going to do some strange funny bunny but not on crochet, we will see the results, its my first timeeeeee….. Awesome. Linking to this from my blog tomorrow morning, for a easter/spring craft roundup! I think my readers will love it as much as I do!